Labeler, make Anker, type: Roland 4/3, for 4.000 bph, adjust to 0,33 lt + 0,5 lt „Maurer“ clip-lock bottle, 0,5 lt NRW- + EURO-bottle and Vichy-bottle, for 2 labels body and shoulder, safety casing, with built on control cabinet, built 1989, for sale for 8.000 €. The machine is since September 2014 dismantled. 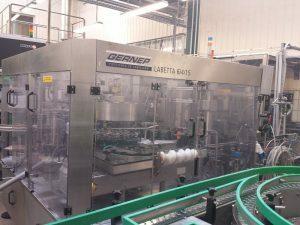 Labeler, make Gernep, type: Labetta 6/4/15 2A BV 2, circulating clockwise with parallel outlet, built 2007, for 12.000 bph, with 3 aggregates for body-, shoulder- and back label as too neck strip, with mechan. Adjusting star for clip lock 0,33 lt and 0,5 lt bottle, sets for 0,5 lt NRW + 0,33 lt + 0,5 lt clip lock + 0,33 lt Vichy-bottle + 0,33 lt and 0,5 lt Longneck bottle, with stainless steel glue roller (hight roller neck: 33 cm, body: 23 cm, back: 14 cm), central lubrication, frequency controlled, height adjustment, control Siemens S7-200, for 23.000 € price negotiable for sale.